I have been having a friendly debate with fellow blogger Will Benton on the merits of Officium, the best-selling ECM CD made by choral group with the Hilliard Ensemble and jazz saxophonist Jan Garbarek - seen above. Will thinks Officum's mixture of medieval polyphony and jazz improvisation represents dumbing down, I think it is a valid destination on the overgrown path of music exploration. A new viewpoint was given on this debate when we saw the Hilliards and Jan Garbarek performing music from Officium and its companion CD Mnemosyne in Norwich Cathedral last night in the opening concert of the Norfolk and Norwich Festival. Increasingly I find the performance space for a concert is as important as the repertoire or performance standard. Norwich Cathedral Priory was the perfect foil for the soaring music, with the Norman roof of the former Benedictine Abbey gently reflecting and prolonging the wonderful sounds. The five performers (plus sparing percussion for a couple of pieces) held the audience spellbound. A shining example of 'less is more' - no amplification, no spotlights, no supporting musicians, just four voices, an acoustic sax, and candlelight. What was unexpected were the spatial and theatrical touches. The cathedral lights were darkened, and illumination was provided by a multitude of white candles. The singers and Garbarek processed around, and between the capacity audience, and the sound of David James' countertenor coming from behind literally made the hairs on my neck stand on end. The performers used both their musical and theatrical skills to produce a masterpiece of music theatre. It may be dumbing down, but it made for one of the most moving performances I have attended for years. Officium started at 8.30 and ended at 10.00 with no interval. It was then a brisk walk up the hill to the mighty perpendicular chuch of St Peter Mancroft. The Benedictine Abbey church was part of the monastery buildings built near the river to provide drainage for the rere-dorter (lavatories). 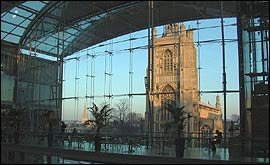 St Peter Mancroft was the town church built on the defendable higher ground, and is the venue for Alexander Balanescu to perform two late evening (10.15) concerts of Bach solo violin sonatas and partitas. This wonderful performing space with its breathtaking hammer-beam roof is in darness with a cluster of candles supplying the only illumination; white candles are this year's black in Norwich! Balanescu's activities span classical, folk, jazz and pop (On his web site that that link opens I am afraid black is the new black). He starts with the B minor (BWV 1002) and empahasises the dance and improvisatory elements of this great work. The B minor partita (BWV 1002) rounds off a perfct evening of music making in perfect surroundings. The path of Bach and improvisation will lead us back to St Peter Mancroft - seen below - tomorrow for Jacques Loussier and his Trio; welcome relief from the tawdry UK General Election campaign which comes to an end with the voting tomorrow. The following night the riches continue with the Tallis Scholars singing Tallis and Shepherd in the same exquisite performance space. I wish I could share your enthusiasm for Gabarek and Officium. Previous ECM cds of this attempt to mix "dooby dooby doo" to early choral music at best makes me laugh, at worst makes me brood about the horror of it all. Richard, I've put up some subsequent postings on this topic, and I certainly think it makes a worthwhile debate. But, as usual, my wife has probably the wisest words. She read your post and said, 'sometimes you need 'dooby dooby doo music'. Man, I am very jealous. I never understood why people wanted their music like ancient bugs captured in amber. Music lives... it breathes through the collective forces of people and time no matter what efforts are made to keep it "authentic". The Hilliard Ensemble's collaboration with Jan Garbarek has been some of the most successful efforts I have ever heard to bring "Classical" music out of Mendelssohn's dusty museum. I love both Officium and Mnemosyne, and don't find them 'dumbed down' at all. I think that blending different styles of music can work brilliantly, as long as neither is diminished in the process. For me, Officium works because both elements are given space and respect, and they intertwine wonderfully. I've always felt that the polyphony is like a series of stately Roman columns, and the saxophone is like tendrils of ivy climbing up and through it (which isn't to imply that the polyphony forms the background -- I think that they get equal emphasis).